In 2012, the television landscape was beginning to shift—the web series and the digital short formats were just beginning to come into their own. Then came Bernie Su’s “The Lizzie Bennet Diaries.” The show’s innovative approach to mixing narrative with a robust, creative social media presence made it a hit, and it became the first show on YouTube to win a Primetime Emmy. Since then, Su has been behind a number of other beloved series, including “Emma Approved,” “Frankenstein, MD,” and “Vanity.” On the eve of Stareable Fest, where Su will be the keynote speaker, he talked with Backstage about how the entertainment industry is changing, building a career on the web, and his relationship to Jane Austen fans. Describe your role as a web series creator. How do your approach and role differ from that of a typical TV producer? I’ve actually never worked in TV. My entire career has been on web-digital-short form, but aside from, say, the budget constraints, there are two big differences. First, the length. When you’re doing one hour or a half hour projects, you are designing for very defined formats—act structure, runtime, commercial breaks, etc. When you’re designing for digital, your run times could be all over the place, and you still need to treat an individual episode as one that can stand alone. Second, user experience. For TV and film, as a creator, I think you can be pretty confident that when a viewer watches your show or movie, they’re committed to at least that time. They aren’t leaving the theater after two minutes if they don’t like it. But in digital, you can’t really predict their experience. They can click away at any time, so what’s keeping them there? The device your viewer is watching your show on may have ten windows open with notifications flying in—just like the device you’re reading my answer on! So you need to design your content for the user, not for the format. 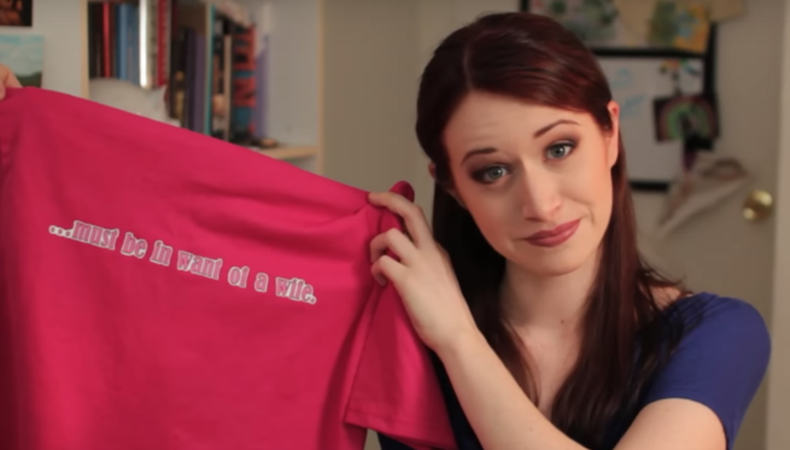 The Lizzie Bennet Diaries broke the mold for how the web series format could be received—it was the first show ever to win a Primetime Emmy, and it opened a lot of doors for new filmmakers. How did your career change after the show became a hit? To clarify, the show itself was the life-changing experience. The Primetime Emmy was a very, very nice validation for what the show achieved. But by the time we won, lives were already changed. Having a breakout hit and winning Emmys did what you’d expect it to do for a creator—more respect, more resources, more opportunities. But I think the biggest change in my personal career was how I was suddenly associated with Jane Austen fans. I can’t say that they all love my work, or love how I adapted their favorite author’s source material, but I can say without a doubt that thousands more people become more familiar with her work and have read the original material because of a couple web series I created. You’re speaking at Stareable Fest, which aims to bridge the indie web series world and television. You played a big part in laying the foundation for this kind of conversation. How has TV changed since you got started? TV became digital. First, there was no money in indie web series, then the MCNs (Studio 71, Machinima) and the VOD platforms (go90, Fullscreen) actually started funding and making shows from indie creators—not all, but definitely some. And then Netflix and Amazon came in and disrupted everyone, including traditional TV. That may seem grim to the indie creator, but I assure you it’s not. These big networks are still looking for new voices all the time. The web-series-creator-to-TV-show development path is better than it’s ever been. Tell us a bit about how your background outside of the traditional entertainment industry—web development and online advertising, for example—has shaped your creative approach. I could write an essay on this. To keep it simple, I’m a communications major but I was a computer nerd. For example, I built my own PCs all through high school and college. I was a web developer as my survival job and then transitioned to online advertising operations, which is basically web developing for online ads. I got to see how the back end of the web works and how the back end of the advertising industry works. Now, I can’t say I’m up to date on all of it but it definitely gave me a unique perspective to my creative approach. I’m not looking to jam ads and products into everything, but I do want to make it easier for more partners to come in. “Vanity” doesn’t happen without Maybelline. “Emma Approved” doesn’t sustain its transmedia insanity without Samsung and Modcloth. What do you think is a showrunner’s most important skill? Again, having only done this for digital, I’d say it’s keeping the show running on schedule and under budget. I think most writers like to think it’s about the quality of your writing, but I don’t fully agree with that. The writing is amplified by the team around you. With ”Lizzie” and ”Emma,” I was always trying to push writing assignments away from me. I don’t have the most credited episode writing credits on either of those shows, and I’m very proud of that. The Emmy win for ”Emma Approved” was for its last three months of content, during which I think I wrote maybe two of the 24 episodes. What was the most important piece of advice you received early in your career? “The sooner you embrace your entrepreneurial spirit, the sooner you will succeed.” It was said to me right as I was starting ”The Lizzie Bennet Diaries.” I embraced it and success came. What’s the most important piece of advice you’d give to filmmakers who are just starting out now who want to get their projects noticed? Just because you put your heart and soul or even lots of money into something doesn’t make it a hit, or even necessarily good. My advice is to build momentum for your career. Make something, play out the run, move on, make something better. With the current project, think about the goal. What do you want it to do for your career? Hone your skills with each project. I don’t know any successful creators or filmmakers who are one-project creators. They’ve done multiple things. You want a career, right? So build it.